Drawn to the raw physicality of the Merce Cunningham Dance Company’s dancers, Brooklyn artist Kenneth E. Parris III set out 20 months ago to document the company’s Legacy Tour. Yet despite the appeal of the performers’ athleticism, he chose not to focus on the company’s historic final performances: Instead, he’s been chronicling the dancers’ off-stage time through a series of graphite sketches – 16 and counting – for the New York Times. 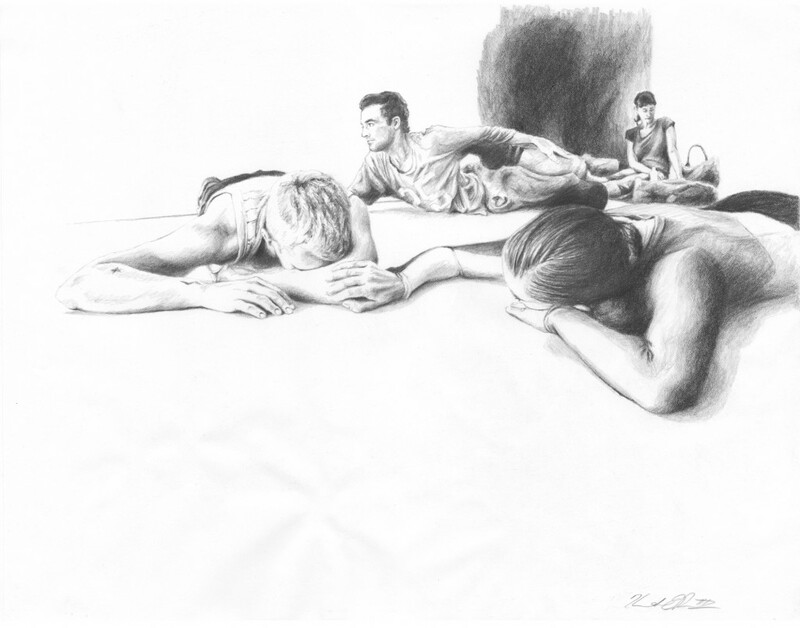 Parris, who describes his own upbringing as blue collar, acknowledges respect for the grueling work – often performed through injuries – of making movement seem effortless on stage, and that’s part of what he aims to capture in his drawings. Parris’ self-financed project, which has taken him from Monaco to Jerusalem to London to Mexico City, this week brings him to Minneapolis, where he’ll commemorate the company’s final performance – one of many over the five-decade relationship between the Walker and the late Merce Cunningham – through an artwork. He recently took time to discuss the project and his relationship with the company. Paul Schmelzer: Do you have experience with dance, or are you learning the culture of the dance world — “the dancer’s way of life,” as the series intro in the New York Times says — as you go along? Kenneth Parris: My parents made it their duty to expose my sisters and me to art, music, dance, and sports. Even though we’re a working-class family, art has always been viewed and celebrated as an essential part of life. When I met a Cunningham dancer through a friend I started attending performances. Several months later, I met Melissa Toogood, who was a RUG [a member of the Repertory Understudy Group] at the time. We started dating and through living together, I was able to see how demanding it is to perform at this level. I get the impression that few administrators within dance organizations — let alone the rest of the public — understand the number of hours dancers spend outside rehearsals maintaining their physicality and working through injuries and chronic pain. Merce’s work, and the final two-year Legacy Tour in particular, is physically and emotionally challenging. Through a bit of a leap of faith, the dancers were generous enough to let me into their private lives so I could gain the insight needed to do this work. Schmelzer: There’s something fascinating about the analog nature of drawing in this age of digital photography: It seems more expressive and also more anachronistic. What are you finding to be the medium’s strengths in telling the stories of your experiences and the final tour of the company? Are there metaphors that come to mind for what you do (the courtroom sketch artist, the official army artist, the embedded war correspondent)? Parris: I have approached this project like a documentary. When I first proposed this to the dancers, I had ideas of what I wanted but wasn’t really sure where it would take me. Photographing and drawing them has been a little bit like capturing wildlife. They’re unpredictable; you just never know what you are going to get. But mostly, I have trusted my instincts and paid attention to what’s going on around me, and then I’ll see something interesting. Using a digital camera has given me the immediacy I need, but drawing has given me more versatility. 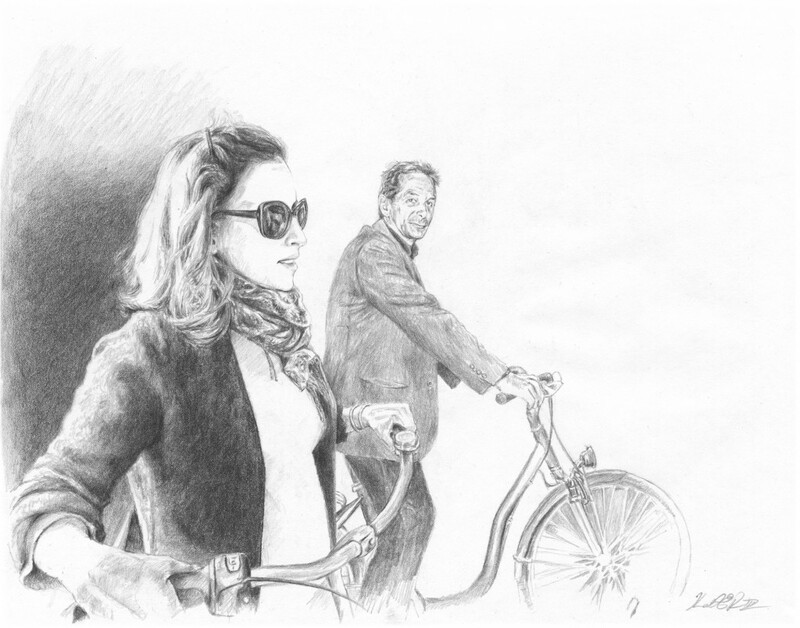 I am not married to the photograph when it’s a reference, and with graphite I have more freedom to manipulate the image. I am able to steer the viewer’s attention not just with the use of composition and negative and positive space but with lighting and selective development; what I choose to render in more detail and what I allow to drop off. Similar to how Alexey Brodovitch was able to control aspects of his images in the dark room for his ballet book, I can put more focus on creating an atmosphere. It’s not about rendering a perfect likeness, it’s about capturing a moment or a spirit of the moment. I can draw the whole figure but put more emphasis on a dancers lips and sunglasses or highlight how expressive someone’s hair or hand may be to tell a particular aspect of a story. Through the end of the tour, my plan is to continue to focus on drawing and next year I will start a series of paintings. I am looking forward to re-working compositions, putting a combination of drawings together, and working with paint and color. Schmelzer: Your artist statement says you draw inspiration from movement — a perfect match for a world-renowned dance company — yet you’re not drawing dance, but instead you focus on what goes on when company members aren’t on stage. Why? Parris: Seeing Merce’s work inspired me to question possibilities within my own. I feel like I started to see more subtlety in movement, and dancers clearly have so much more knowledge and control over how their bodies move through space. We have seen art that focuses on performance and rehearsal, like the paintings of Degas, for example. But I’m also fascinated in what drives people to get out of bed and to push the Sisyphean boulder up the hill again and again. These dancers are driven and dedicated to their craft and what they do onstage seems so unattainable. For most of us it is just that. But under the patina of grace and glamour, there lies a working-class ethic. I saw this tour as an opportunity to explore and tell the dancer’s story from a different perspective. Schmelzer: A reviewer from The Observer reveled in Merce’s close observation of the natural world: “He records with absolute precision the way that currents of activity flicker through a group as it responds to an atmospheric change or unsettling event; the way that patterns form and dissolve, giving the momentary impression of order, of conformity to some unknown set of determinants.” That’s not unlike the part in your artist statement that says you “explore interpersonal relationships and the effect of an individual’s action on the surrounding human landscape.” Do you feel an affinity for the late, great Merce? Have you ever met him? And how is this sentiment from your artist statement manifest in your drawings? Parris: I do feel an affinity for Merce. I continue to be very affected by his work and the dancers that do it. I have met him before and even did a quick pen and ink sketch of him once when I was in St. Cloud for the performance of Ocean at the Rainbow Quarry in 2008. One dancer was injured during rehearsal, and it was amazing to watch Merce work with the others to make adjustments and cover parts. They had very little time and everyone worked together very calm and professionally. In a world that seems to glorify hyper-individualism and social dysfunction, this group of people works together everyday on and off stage. It is inspiring to see people contributing to something that is bigger than themselves. I hope that my work captures some of this ethos and stimulates a personal experience for viewers. 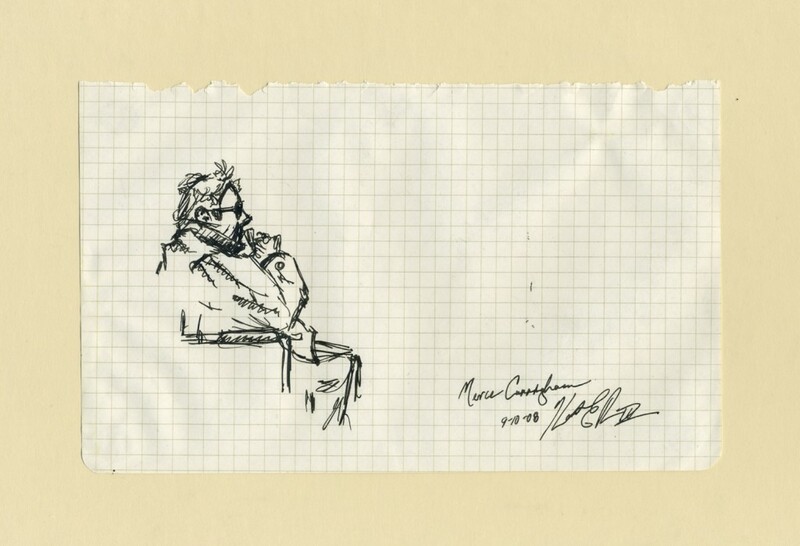 Parris’ sketch of Merce Cunningham at the 2008 performance Ocean near St. Cloud, Minn. The Merce Cunningham Dance Company performs Nov. 4-6 at the Walker’s McGuire Theater. 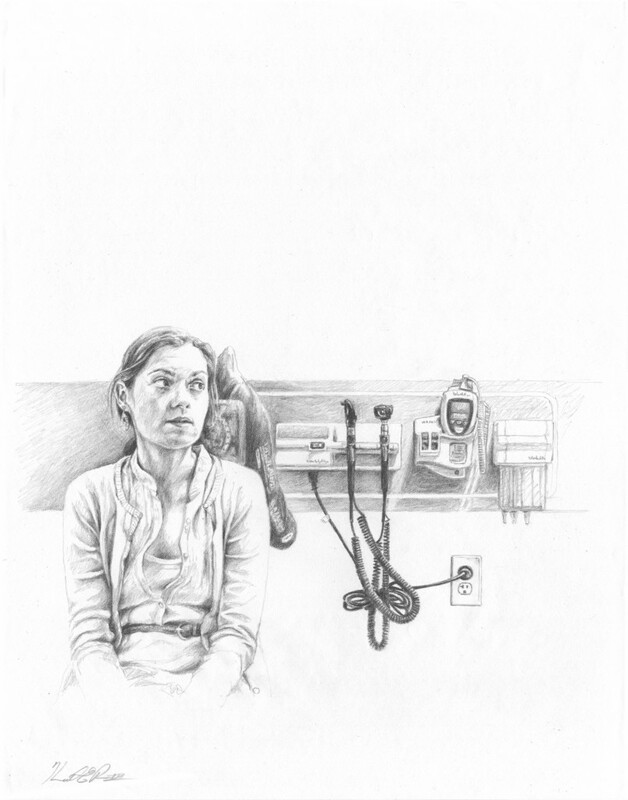 Parris will be here for the performance and promises to share his sketch from the visit.